Ursula Dimitriou graduated from the National Technical University of Greece in Athens in 2000. She has an MA in Art and Architecture from UPC in Barcelona and a PhD focused on design and politics from the Department of Visual Cultures at Goldsmiths University of London. She has seven years of teaching experience in BA and MA level in Architecture, Urban Design and Visual Culture, leading design studios and contextual studies modules at Central Saint Martins, Westminster University in London, Welsh School of Architecture, University of the Creative Arts in Farnham, Goldsmiths University in London etc. Ursula’s research interests include public space, common space, participatory design, design and social sustainability, grassroots urban practices, theatrical and ephemeral practices in the urban space, public art, visual media as a research method. She works as a free-lance architect is a founding director of Studio SYN, an interdisciplinary design practice. Her practical experience spans over fifteen years as a qualified architect involved in all stages of project development, from conceptual design to planning applications and construction management. She has an extensive design and detailing experience across a range of sectors with an emphasis on residential, hospitality, retail, arts and culture. Dejan is an architect, artist and lecturer. He holds an MA in Fine Art from Central Saint Martins, London (2017) and a Degree in Architecture Engineering from the University of Belgrade, Serbia (2006). Alongside Ursula Dimitriou, he is a founding director of Studio SYN. Dejan teaches architecture at Central Saint Martins BA and Welsh School of Architecture. 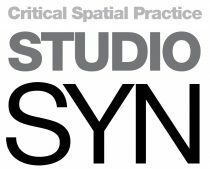 Before setting up Studio SYN Dejan has worked in London on master planning, urban regeneration, refurbishments, mixed-use, housing and arts & culture projects for a number of award-winning design-led practices. Dejan has also worked directly with private clients, start-up design businesses and art organisations. Dejan works at the intersection of art and architecture, and address his interests through drawing, repetitive body actions, testing body limits, mark-making, rhythmical gestures. He builds his art work on a strong theoretical base and while doing so, he seeks out to create robust, immersive experiences for both the participants and the audience. He uses a range of media, such as performative drawing, video collage, spatial installation and sound. He regularly collaborates with fellow artists and professionals active in the fields of literature, music, visual media and architecture, bringing in their knowledge, methodologies and worldviews.